If you are in St Petersburg this month, “Wall Elements” is the exhibition to see. Opened at the Manege Central Exhibition Hall in collaboration with RuArts Foundation, “Wall Elements” is the second edition of a project launched several years ago by the photo artist Alex Partola. He is best known for photographing and chronicling developments in street art all over Russia. And that, in a nutshell, is what “Wall Elements” is all about. Seventy artists are represented at the exhibition, coming from seventeen cities as far flung as Kaliningrad and Petropavlovsk-Kamchatsky. Some of the works document illegal graffiti. Others are paintings, installations and sculptures made by street artists. “It’s the first exhibition of street art entirely by Russian artists on this scale,” Partola told The Moscow Times. Partola conducted research in each of the seventeen cities to determine the main players on street art scene and then asked them to submit works that captured their particular style and methods. Each of them used a form of expression that’s most relevant at the moment. “Some time ago street artists still debated whether they should work with galleries, but today most are cooperating with various institutions and are learning new techniques all the time,” Partola said. In each city the curator only worked with local artists who had an actual street art background. 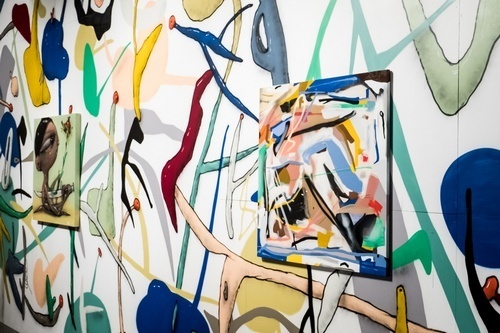 Among those exhibited at the Manege you can find both up-and-coming artists and well-known names, like Misha Most, author of the largest mural in the world, or Luka and Aske, who are often exhibited at the RuArts gallery in Moscow. More than 100 works occupy all of the space inside the Manege, as well as a square at the back of the building, where large-scale graffiti was created outdoors by 16 artists. At the entrance you can see an installation by Alex Partola entitled “Tunnel: Kaliningrad – Petropavlovsk-Kamchatsky.” It’s a two channel video complimented by 38 black and white photographs of abandoned industrial spaces favored by street artists. “It depicts what happens at night, in the shadows, when the street artists come out to do their work,” said Partola. Luka, who likes to work with wood, made an enormous installation from found objects. Aske, known for his murals with 3D elements, went one step further, producing an actual sculpture of a graffiti artist in front of a wall. Misha Most’s installation consisted of a mock-up wall with a graffiti that continues his “romantic science” theme. The exhibition is only part of the “Wall Elements” project. “Each of the art objects at the exhibition has an extension on the streets of their cities and you’ll be able to see that in the book,” said Partola. The book, which will come out in September, will be the second volume of street art produced by Partola. The exhibition runs till August 26. Manege. 1 Isaakievskaya Ploshchad. St. Petersbug. For special events and educational program check Manege’s website.